As far as Rugby is concerned the area is dominated by Blooms Garden Centre, part of Wyevale Garden Centres. Alongside that garden centre is the World of Water aquatics centre, one of the largest in the country. Two of the garden centres in Rugby listed as being open by other garden centre review sites are in fact now closed. They are, Medda Place Nursery (now trading as Rimo Growers) and Village Farm Nurseries. 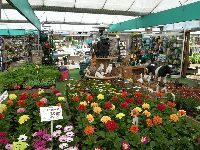 Other garden centres outside but nearby Rugby can be found in Coventry garden centres and Warwickshire garden centres.